The need for strategies in any facet of life cannot be over emphasized. The Worth of a man’s career, business/job may summarily be a reflection of the worth of that man. Therefore, since everyone wants to live the good life amidst stiff competition, good strategies to beat the competitors and negative factors that may hinder such individual from getting that dream job and building successful career is very expedient. It is in the light of this, that this book was compiled. It will help every career person, whether an individual searching for a job or an employee already working. Here, you will learn strategies to put in place to get that dream job and strategies to put in place to manage your career. 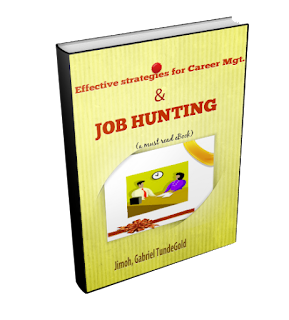 Effective Strategies for Career Management and Job Hunting is a Must read for all Applicant, Employees, Employers and Human Resource Executives. I assure you that you wont regret buying this..Happy Reading!